One of the most frustrating things about having a baby who refuses to sleep in her cot is that you know she is exhausted - because you are also exhausted. So is there a panacea for this timeless problem? Routine is a great teacher. But getting into one is not so easy. It takes time and perseverance on your part. But at the end of the day it makes for a happy family. Try to have a set bedtime. As it approaches, watch for signs that your baby is getting tired. She may cry for a prolonged period and only settle when you lift her. Or she may rub her eyes or pull at her ears. Try to notice such signs, because if she gets over-tired it will become more difficult to settle her. A warm bath can be a wonderful way to prepare baby for sleep. You may like to try adding a few drops of essential lavender oil as it is renowned for its relaxing properties. Or add some specially formulated sleepy baby bubble bath. Avoid playing with the baby during her bedtime bath. You do not want to get her excited as this will have the opposite effect to that intended! Simply trickle some warm bath water over her as she lies in the bath. After bathing, many babies are very receptive to a baby massage. Play some soft music as you massage her. You can give a dry massage, without oil, or an oily massage using extra virgin olive oil. If you do intend using any oil place a small amount of it on her inside arm and leave for about ten minutes. Check to ensure there has been no reaction before massaging her. If she is fine, rub a small amount of oil, about the size of a ten pence coin, into your hands. This will warm the oil and not shock the baby! Do not rush the massage. Keep it slow. She will let you know if she is not happy. If this is the case, end the session. Try again the following night. There are lots of good baby massage books available which show you a variety of massage techniques. And many organisations run free courses. Ask your health visitor to keep you informed. After her massage, give baby a cuddle and dress her for bed. Keep your movements slow. This will ensure she stays calm. Some babies enjoy a feed before sleeping, so you may like to feed her after her bath. If she is breastfed she may fall asleep on the breast. 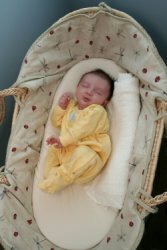 It is best to waken her before placing her in her cot as babies can get frightened if they awaken in different surroundings to those in which they fell asleep. New parents, and even experienced parents, can often be indecisive about what is required for the baby to settle in her cot. Should baby go to sleep in the dark? Or should you leave a light on? Should you play music? Or is silence better? For many parents the solution is to leave a small, dim, night-light on so that baby will not be frightened if she awakens later on. It is also a good idea to play a soothing lullaby CD and leave it playing quietly on repeat. Play the same CD every night and baby will begin to look forward to bedtime! Babies love repetition. It makes them feel secure. Babies are never too young for a bedtime story or a lullaby. And many babies have a favourite bedtime story that they like to hear every night before sleeping. If your baby gets upset when you place her in the cot, stay with her for a few moments. Tell her firmly that it is bedtime and say goodnight. Leave the room, but stay nearby. Allow her to cry for around thirty seconds. Return to the room and again say goodnight. Do not chat! If she is standing up, lie her down. She will probably scramble straight back onto her feet! Leave the room again. Each time wait slightly longer before returning. It can be a good idea to move around nearby, but not in the same room, and allow baby to hear that you are nearby. You may like to hum a tune or chat to your partner. Avoid keeping the whole house silent. Babies need to learn to sleep through some noise. If baby gets very distressed, simply return to her and comfort her with a little hug. And then lie her down. It can be incredibly difficult to refrain from lifting her. But be assured that eventually she will fall asleep. Within two or three nights most babies stop protesting and have learnt what bedtime means. Many happily lie down and fall straight to sleep once the routine is established. As a result your baby will be happier and so too will your family!